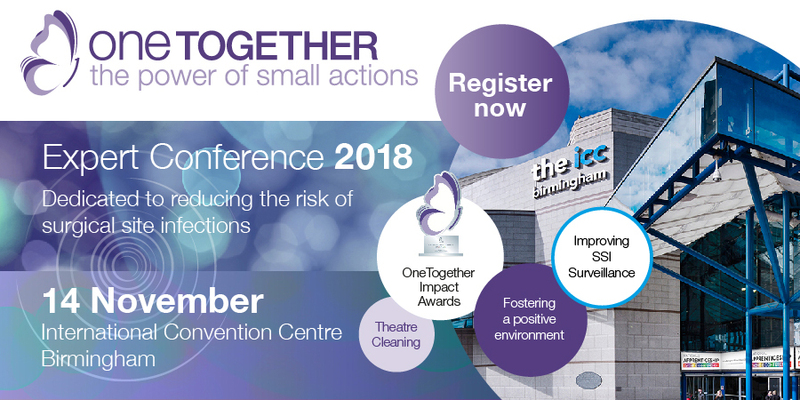 The fifth annual conference for OneTogether will see the launch of our third Quality Improvement Resource, which is focused on the surgical environment. The conference is free to attend, and brings together hundreds of clinicians from across the UK and further afield, with places on a strictly limited basis. Learn about OneTogether and the latest evidence to reduce SSI. Explore how theatre ventilation, movement in and out of theatres and cleaning processes can impact SSI. Discover best practice examples to reduce SSI from hospitals across the UK. Understand how to foster positive team relationships and their impact on patient outcomes. Attend the second Impact Award ceremony and hear about the winning entries. Network with colleagues across the UK and Worldwide. Vanessa Whatley is a Head of Nursing, leading a variety of organisation-wide specialist nursing teams across community and acute services in a large combined NHS Trust in Wolverhampton, UK. Prior to this she worked at regional level advising NHS Trust boards in the West Midlands on best practice in the reduction of healthcare associated infection, leading to many improvements, and in two further NHS Trusts infection prevention teams. She has developed system wide strategies, led multiple change initiatives, and overseen a number of technical innovation reviews. Vanessa has a strong interest in research and development and a good analytical approach to service improvement and redesign. In 2012 Vanessa lead the set-up of large scale surgical site infection programme reducing this category of infections by half. Robert is a scrub nurse in the Vascular theatres at East Lancashire Hospital Trust. After being involved in a Never Event he implemented a new cultural improvement concept, below ten thousand. Anyone in the operating theatre can call ‘10,000 feet’ which creates the sterile cockpit methodology. What has become apparent since introducing the concept is that it is harm free, flattens the hierarchy and improves patient safety. *Powerpoint slides not yet available. Peter Hoffman is a Consultant Clinical Specialist in Public Health England with backgrounds in disinfection, sterilisation and specialist ventilation. He applies this experience both proactively (helping in the production of guidelines and standards) and reactively (outbreak and incident advice and investigation, plus a wide variety of general advice). He teaches in the UK and internationally, is an Assistant Editor on the Journal of Hospital Infection and has published widely. Kat , RGN, Dip (Infection Control), Cert Ed, MSc, advanced health care practice, has many years' experience in healthcare. Specialising in infection prevention and control since 1995 Kat has held a range of clinical and senior positions within the NHS (Oxford University Trust) and independent sector (BUPA, Spire, BMI), also as a regional co-ordinator for the 2006 point prevalence survey in England. Kat is a qualified lecturer with experience in curriculum development and teaching on undergraduate and post graduate courses. Kat is an active member of the Infection Prevention Society (IPS) and has a role on their scientific planning committee. Kat joined 3M in 2013 and this has provided an opportunity to focus on strategies to reduce the risk of surgical site infection. OneTogether to reduce surgical site infection is a collaboration developed from this platform. Karen Denman is an Infection Control Surveillance Nurse. Karen has been in her role since 2007, she is an integral part of the Infection Control Team, undertaking Surgical Site Infection Surveillance for patients undergoing various surgical procedures, form mandatory surveillance to local surveillance. Karen’s passion is to improve outcomes for surgical patients by reducing the rate of infection; most of which is avoidable and has adverse effects on the holistic well-being of patients. The role is both challenging and diverse; working to reduce resistance to change and improve professional practice along the patient surgical pathway. Karen has undertaken audits for theatre practices, including the timing of pre-operative antibiotic prophylaxis. Jennie is an Associate Professor at the University of West London, where she is involved in a range of research related to healthcare associated infection. She worked for the Health Protection Agency for 17 years, primarily in developing and leading national programmes to support the capture of data on healthcare associated infections (HCAI), in particular the Surgical Site Infection Surveillance Service. Her PhD is on designing using surveillance to improve health outcomes. She has 13 years of experience in clinical practice as both an infection control nurse and deputy Director of Infection Prevention and Control; is Deputy Editor of the 'Journal of Infection Prevention'; and an active member of the Infection Prevention Society. Jennie has authored the textbook 'Infection Control in Clinical Practice', and has published an extensive range of clinical papers. She is also experienced in systematic review of evidence and a lead author on the 'Epic National Evidence-based Guidelines for Preventing HCAI in NHS Hospitals in England'. Dr. Palfreyman is a historian of medicine at the Centre for the History of Science, Technology and Medicine at the University of Manchester. Her work explores the visual culture of disease and surgery in nineteenth- and twentieth-century Britain. Previously she has worked at Imperial College London on a project investigating the origins of keyhole surgery, as well as a public engagement project ‘The Time Travelling Operating Theatre’ which staged recreations of surgeries from three time periods at museums across the UK. Adrian commenced his theatre nursing career in 1982 whilst serving in the Naval Nursing Service (Q.A.R.N.N.S). In 1996, Adrian returned to his home cities, Norfolk & Norwich University Hospital, to become one of the first Orthopaedic Surgical Care Practitioners (SCP) in England: a role where non-medical professionals practice surgical interventions within a Consultant led surgical operating team. Adrian encourages role development within perioperative teams and has represented AfPP in national working parties/consultations on advanced perioperative roles and has spoken internationally on the subject.